I'm killing time and here are the results. I do a lot not to go bed early. I've always been that way - a late owl at heart. Today I found this drawing and the photo that inspired it in an old pad of drawing paper. 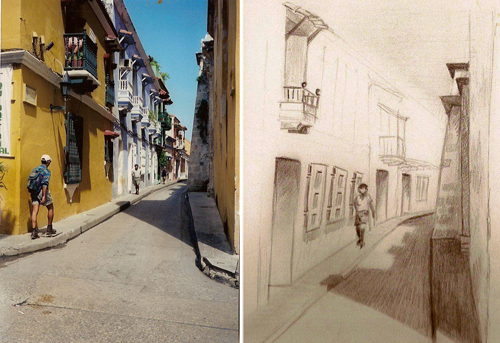 I took the photo in Cartagena, Colombia in 2001 when we went to a friend's wedding. I think the drawing came a month or two after that. Cartagena is an AMAZING place. It's just so full of history and lots and lots of color and art. 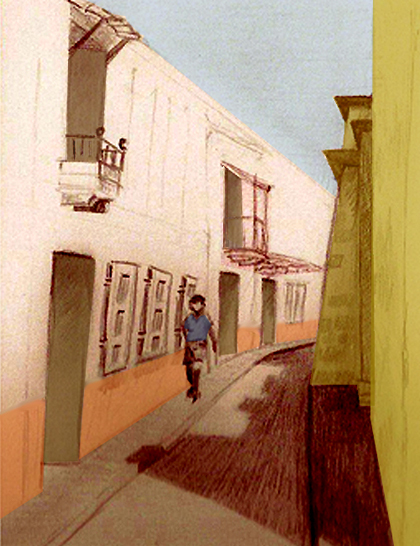 The old part of Cartagena has been preserved and it's gorgeous. I remember feeling visually bombarded everywhere we went. All I did today was work on color. I've had the drawing thing on my mind for several days. I really need to do more of it.